Our Journey has ended. But it is not the end, rather it is the beginning! Today my friend Robin takes us on a journey and ends at an empty tomb. It isn’t just a story, however, it is truth and revelation. It is what gives me hope and proves Christ is the conqueror over sin, death, and the grave. Take this journey with me, won’t you? “You have heard the stories of a Messiah since you were born. At times you shrugged them off as simple stories passed down from your parents and grandparents. Then, as you grew older and wiser, you began sharing the hope of your ancestors. Someday God will send Messiah. One day you begin hearing stories of this man who heals the sick, casts out demons and forgives sin. The word on the street is that he may be the Messiah, but you just aren’t sure. Something in your heart wants it to be true, but reality sinks in and you begin to doubt. The stories about this man continue to spread. More and more people begin to believe he truly is the Messiah. Your hope begins to grow as well. Maybe. Just, maybe. As you prepare for Passover with your family you hear of the uproar caused by this man. You enter the streets and see a mixture of emotions. Some crying “Crucify!” Others crying bitter tears as they watch one they love suffer. The hope in your heart is almost unbearable now. Could this truly be the Messiah? There has never been such a fuss made over anyone before. Then, as he carries the cross on his back through the streets, blood pouring from his body, it happens. That one moment that defines who you are. He looks at you. Straight at you and no one else. You feel as if the entire world has disappeared and you are alone with this beaten and bruised man. He is looking at you. His eyes. His eyes penetrate your soul and you know, in an instant, He is the Messiah! You take a step back to process things. You go back home where it is safe and recount all of the stories and prophecies you have been told of the coming Messiah. You cry. You pray. Then, it’s over. He is gone. The man you knew in your heart to be the Messiah is dead. This crushing blow causes your faith to shake at it’s core. You believed. He made you believe. He looked deep in your soul and revealed Himself to you. Sleepless nights pass. You can’t get the look of His face out of your mind. You can’t stop crying over the loss of the hope that had grown deep inside. The heartbreak is more than you can take. You ask the tough questions and meditate on the prophecies. You must find the answers. Then you hear rumors. Rumors of an empty tomb. The hope that died on the cross begins to burn. But you need proof. So you go to the tomb where they laid Him. As you arrive the tomb is surrounded by guards, them questioning how a stone so large could have been rolled away. They all speculate on the disappearance of the body. And you wonder, could it be? You walk closer, hoping for a glimpse. An answer. 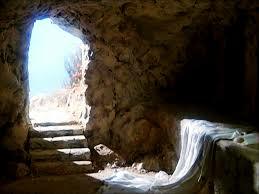 You step in and see the tomb is truly empty. But still, no answers. You are confused, but hopeful. You cross paths with a man who is walking on the road. You look up but words won’t come out of your mouth. His eyes. His eyes. The man smiles and walks on. You stop, frozen. His eyes. You run back to the streets and begin sharing your story. Your doubts, questions, fears and the answer. Jesus IS the Messiah, and He has risen, just as He said He would, just as the prophets of old said. The stories handed down from your ancestors are true and are now fulfilled. “Have you lost the excitement that used to flood your heart when you thought about the resurrection? Have you lost sight of the victory Jesus has over death and the grave? Have you heard the stories so many times they have lost their power? Go ask a young child to tell you the story. Listen intently to the details she gives and the hope in her heart. Renew your childlike faith. Originally posted at IGetUpTooEarly in April 2014.